Ghost Rocket is the new 60’s psychedelic garage punk band by Morten Aron, former lead guitar player in On Trial. He left On Trial back in 1999 after the Roskilde Festival and has put out a couple of solo records on Sort Hash or Orpheus (www.orpheus.dk) Records but this is his first live outing. The band also features Nick on bass (Hybris), Nicolai on organ and on Claus drums. 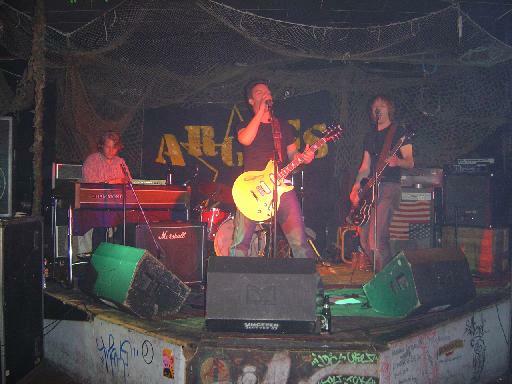 The band were opening for a band from Argentina called Argies. I did not stay to see the Argies on this Wednesday night. The band had a really cool authentic 60’s sound with the organ. Morten also sang lead vocals. The band played mostly originals but included a couple of cover songs as well. It was great to see and hear Morten rocking again. The band will release a single with Drug Freedom and 1 Million times this year. Look out for it! Set List: Ghost Rocket, Out of your Mind, Daredevil, Drug Freedom, Dissatisfied, 1 Million Times, I think I love You, Hounds on my Trail, Blow to the Soul, Hypnotized, Going Home, Straight to Hell, ?